Online experiment is a real or simulation experiment with real laboratory instruments and equipment that can be controlled by a computer through the internet. Artificial Intelligence in education (AIED) is an interdisciplinary topic including computer science, cognitive and learning sciences, education, game design, psychology, sociology, linguistics, as well as many domain-specific areas. It promotes rigorous research and development of interactive and adaptive learning environments for learners of all ages, across all domains. The workshop aims to offer the opportunity and provides forum of discussion and collaboration for researchers and practitioners to exchange issues. It offers to the participants an opportunity to present their recent work and experience reports, and to take part in open discussions, in workshops. 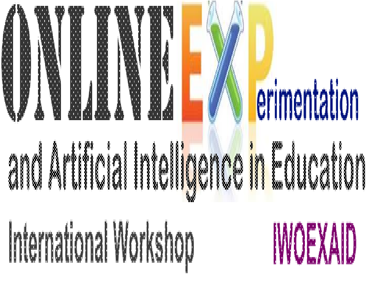 Extended versions of best selected papers presented in the International Workshop on Online Experimentation & Artificial Intelligence in Education 2015 will be published after further revisions in a special issue of International Journal of Online Engineering (iJOE). (indexed by Compendex (Elseiver) Scopus, INSPECT(IET), blp,EdITLIB... etc).